A shoot manager on the prestigious Skibo Estate has been convicted of possessing over 10kg of a highly toxic banned pesticide — enough to poison the entire Scottish population of birds of prey six times over. This morning at Inverness Sheriff Court, Dean Barr was fined £3,300 for possessing 10.5 kg of Carbofuran, illegal in the UK since 2001. 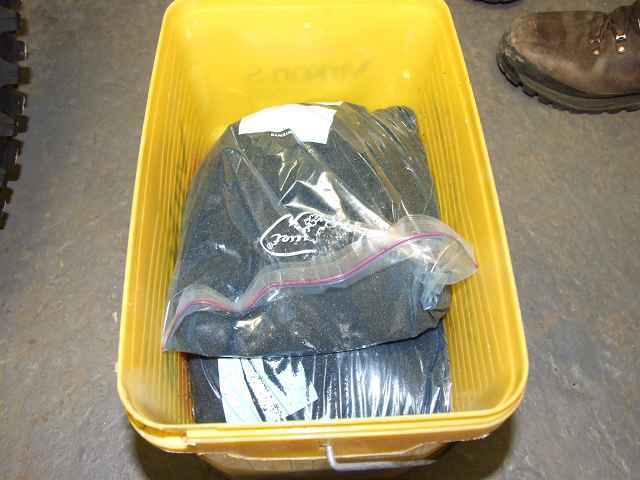 The highly toxic substance was discovered locked in a store, to which Barr had the key, during an investigation and search conducted by Northern Constabulary. Tub containing supply of Carbofuran — Skibo Estate, 8 May 2010 (RSPB Scotland). Police were alerted to the estate in east Sutherland — a popular venue for celebrity weddings and recently seen by viewers of TV series Masterchef — on 5th May last year, following the discovery of a dead Golden Eagle by a group of hill-walkers. Unbeknown to the group, less than two miles away, another dead eagle had been found only three days previously which was also reported to the authorities. Poisoned Golden Eagle — Skibo Estate, 7 May 2010 (RSPB Scotland). 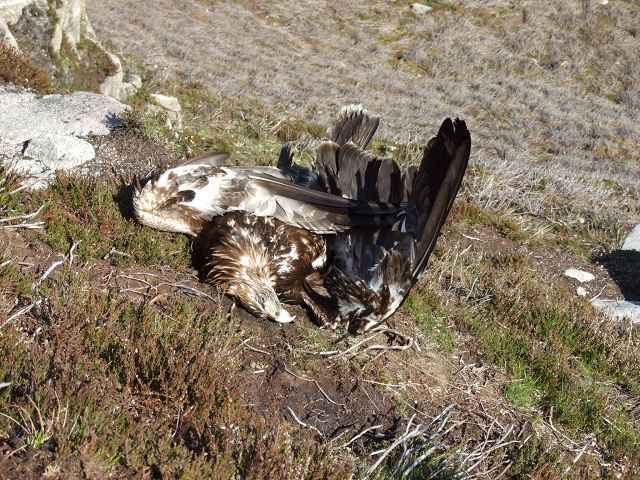 A further visit by Police, assisted by RSPB Scotland staff, to the estate resulted in the recovery of a dead Red Grouse — a suspected poisoned bait — staked to the ground; nearby lay the body of a Sparrowhawk and Buzzard, while just a few hundred metres away lay the contorted body of a third Golden Eagle. Subsequent tests by Scottish Government laboratories confirmed that two of the eagles, the Sparrowhawk and the bait contained traces of lethally toxic poison Carbofuran. The third eagle had also been illegally poisoned with Aldicarb, another banned pesticide. However, no charges or convictions have been made in connection with these incidents. Stuart Housden, RSPB Scotland Director, said: "If ever there were a more compelling reason for an individual to feel the full weight of the law in a wildlife crime case, then the conviction of Dean Barr was it. Carbofuran is a deadly and illegal substance, regularly used as a poison by those who wish harm to birds of prey in Scotland. Barr, a man who is a professional sporting manager with years of experience, was found with an unprecedented amount of this banned chemical in his possession. We are pleased that the Sheriff has sent out a clear message that society will not tolerate such reckless and deplorable behaviour in the countryside."